Next Stop for Kailash Kher World Tour the US! After his tour in the UK, Kailash Kher’s next stop is the US as he brings Contemporary Indian Music to New Jersey. ARIZ Inc. presents internationally acclaimed artist Kailash Kher, with his band Kailasa, in New Jersey on May 11th. Kailash will be performing from his fourth and highly anticipated studio album Rangeele which debuted in January 2012. Kailash rose to fame with his song ‘Allah Ke Bandey’ for the critically acclaimed movie Waisa Bhi Hota Hai. He’s often coined as India’s answer to the late Sufi maestro Ustad Nusrat Fateh Ali Khan. He is praised for his talents as a lyricist and his ability for beautifully combining traditional and modern music. Some of Kailash’s most famous songs are ‘Chak De Phattey’, ‘Arziyan’, ‘Bhangra Pauna’ and ‘Ya Rabba’ and his acoustic version of the super hit ‘Tu Jaane Na’ from Ajab Prem Ki Gajab Kahani. Kailasa is one on India’s leading young contemporary fusion bands, which was formed in 2004, with Kailash and his brothers Paresh and Naresh. Their first album contained popular songs such as Teri Deewani, Dilruba and Tauba Tauba. Kailasa has released 2 additional albums thereafter, which have also topped the music charts. Kailash is currently touring the UK and US, and will be in New Jersey for only one night. 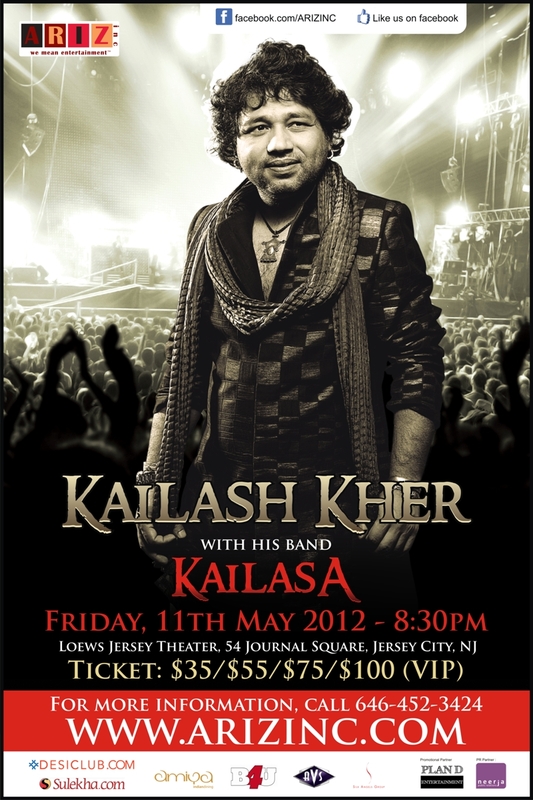 ARIZ Inc. will be presenting Kailash Kher on Friday, May 11th, 2012 at the Lowes Jersey Theatre in New Jersey at 8:30 pm. Tickets range from $35-$100 and can be purchased at www.arizinc.com.